Do you remember that feeling of joy you had as a child while painting a picture, building a snow fort, and building a birdhouse with your dad? Or the sense of accomplishment after helping your parents gardening, baking, and vacuuming? Hands connect us to our environment, to self and others. Unfortunately, in today’s world, children are deprived of the powerful opportunities to use their hands to create, engage and connect. Let’s look into the life of today’s average child. What are they typically doing with their hands? Are they having any responsibilities? Are they helping with cooking, cleaning, or gardening? Are they using their hands to participate in play, arts or crafts? The reality is that kids’ responsibilities and play have been replaced by digital screens serving as a free babysitting service and a child entertainer. For many children, their main hand activity is swiping a screen with an index finger. Kelly Lambert, a neuroscientist at the University of Richmond, discussed on CBS News the theory that busy hands alter brain chemistry and make us happy. She's been using rodents to study the hand-brain connection and found that ‘rats made to dig for a reward showed greater signs of mental health when compared to rats who got a pass on doing any physical work’. Our kids get a pass on doing physical work. They are disengaged from activities that occupy their hands in play, leisure, and chores. Technological advances have contributed to children being immediately rewarded without investing any physical effort. This type of lifestyle is depriving children of the benefits of using their hands, creating the hand-brain disconnect, thus negatively affecting their emotional wellbeing. 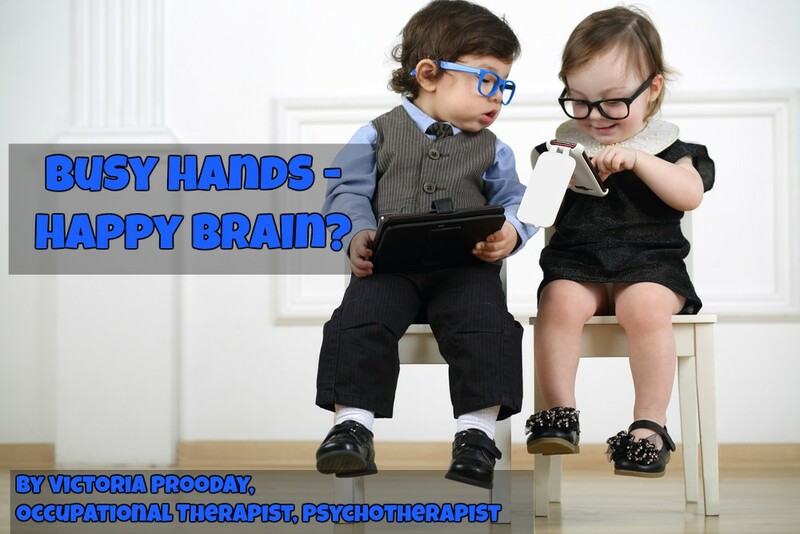 Busy Hands – Happy Brain! As an occupational therapist for over 10 years, I have been recommending activities that occupy kids’ hands as the primary form of therapy for children with behavioral issues, anxiety, ADHD, and Autism. Kids’ progress is incredible as busy hands rewire the brain to become calmer, happier, and more responsible. Get your kids’ hands busy. Bring back the fundamentals of a healthy child development. Bring back responsibilities and activities that require putting in an effort to achieve the end result. Below are a few simple, yet powerful ideas that you can implement at home. Household chores for kids. Involve children in tidying up, folding laundry, hanging clothes, unpacking groceries, setting the table, making lunch, cooking, unpacking their lunch box, making their bed, gardening, washing the car, shoveling snow, and watering plants. These are all tasks that parents do on a daily basis, so make sure to include your child in the tasks too. It allows you to spend quality time together, and you are also teaching your child excellent life skills all while engaging their hands and bodies. These tasks are an excellent way to break the routine of screen time for your child. Self-care activities. Encourage kids as young as two years old to brush their teeth, dress themselves, hang their jackets, take off their own shoes, brush their hair, and carry their own backpack. These activities engage hands, develop problem-solving, attention, and independence. Art/play activities. Examples include making origami, paper airplanes, mosaics, scrapbooking, collages, making projects with plasticine and clay, woodworking, knitting, stitching, quilting, painting, and playing musical instruments. If you provide the supplies and introduce these activities to your child, you will be surprised to see their interest in the tasks and the positive changes in their emotional wellbeing. Paper and pencil activities. Involve children in making shopping lists, greeting cards, writing notes, keeping journals, and drawing by color/number activities. Children must use and develop their hand skills by engaging in manual activities that involve paper and pencil activities since hands and brain are connected. Outdoor activities. Activities include wheelbarrow and animal walks, climbing on trees, monkey bars, playing tennis or basketball, drawing with large chalk pieces, finding hidden rocks/small objects in the sand, and playing with sand shovels and sand toys. Spending time outdoors and breathing fresh air is critical for emotional wellbeing and gross motor development. Human beings are not meant to spend long periods of time indoors with little to no outdoor time, and children especially need outdoor exposure for healthy growth and development. We can’t trick human nature. If our children don’t use their hands for what they are meant to do— CREATING, ENGAGING, and CONNECTING— they will inevitably pay a heavy price for it with their emotional wellbeing. Guide your child to the variety of activities that they can participate in. You will develop a stronger connection with your child while promoting their physical and emotional wellbeing. Jul 9 Why Using Gadgets During Mealtimes is Damaging Your Child and How to Stop It?